Most would be familiar with Suntory’s popular Hibiki blend which brings together the Chita grain with Hakushu and Yamazaki. For many years, Suntory kept Chita nearly ‘secret’ in Japan – with no exports available. I remember when I first picked up a bottle in Tokyo (July 2014) – our tasting group in Mumbai were astounded by its exquisite, perfumed and nuanced character. Before featuring it in an article on Japanese whiskies, I reached out to the folks at Suntory to ask if they had any plans to market Chita outside of Japan. That was mid 2015 and the answer was “not yet” with plans clearly afoot to change that state sooner than later. So when the NAS export version “The Chita” became available at Singapore duty-free a year later, I was excited to try it! Thanks to a “speed dating” sample sip at the airport, I had this chance, however didn’t discover much of what made our original experience so interesting. Since then we’ve had more grains and know to calibrate expectations. And as always, the best thing about exploring whiskies with a tasting group – in this case the Whisky Ladies – is the different impressions which includes those who come with a fresh open approach not coloured by past experiences. So what did we collectively think? Overall we pronounced this one for the “easy drinking” category. Completely pleasant and one that could be brought out as an enjoyable uncomplicated option. One lady shared she generally keeps a bottle of The Chita stocked and prefers it with ice and a splash of water for a simple refreshing wind-down drink. What is interesting to note is that while the age is not stated, part of the character comes from the grain aging in a variety of casks – American White Oak, Spanish Oak and wine. This combination is given credit to producing a grain that is mild and smooth. Suntory shares that they’ve produced grain as “dashi” or a broth base for their blends since 1972. Yet only with the craze for Japanese whiskies globally and a growing interest in grain as a category on its own has The Chita become available since 2016. And what do they have to say? 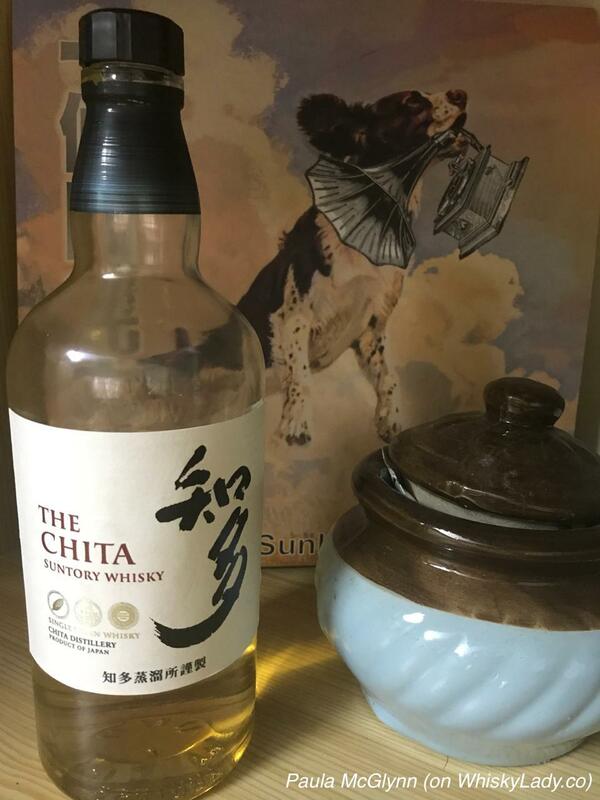 Shinji Fukuyo describes The Chita Single Grain Whisky as the “serenity of Japanese whisky.” Like the misty, calm seas of the Chita Peninsula on a day of elegant stillness, this airy whisky has a presence that is unmistakably serene. From the House of Suntory Whisky, a mild, smooth single grain whisky with unparalleled sophistication and a clean, clear finish. And what would a bottle of The Chita set you back? You can find it at Changi airport in Singapore for approx SGD 80 / USD 60 / INR 4,250. By Asian standards that is quite reasonable and more importantly, it is available in several airports in the region making it easy to pick up too. From that perspective, it is an easy buy for an easy drinking alternative. What else did the Whisky Ladies try in our Grain evening? You can find more on a page dedicated just to Grains here. This entry was posted in Beyond Scotland, Grain, Japan and tagged Grain, Suntory, The Chita by Carissa Hickling. Bookmark the permalink.